A nine mile walk from the Tan Hill Inn passing over Robert’s Seat into Whitsundale before returning via West Stonesdale and the Pennine Way. 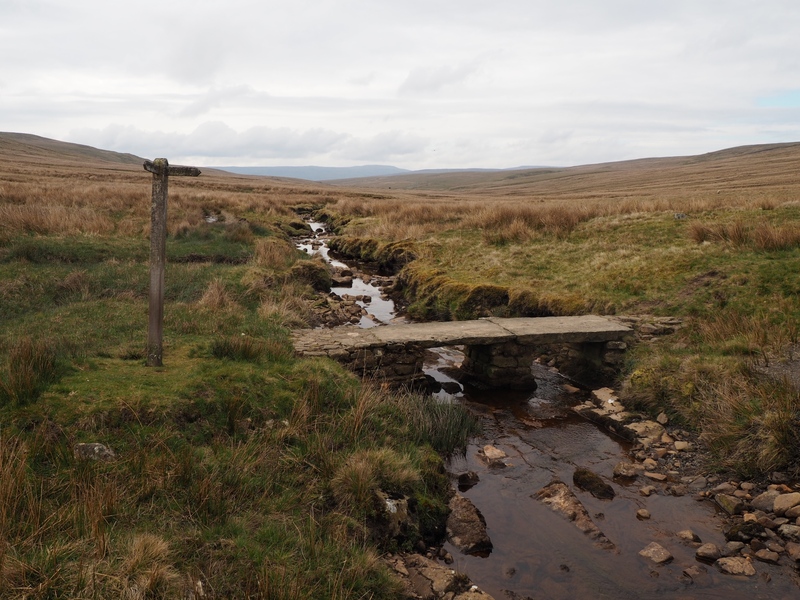 It has been a long time (almost 13 years) since I’ve trodden the section of the Pennine Way between Keld and the Tan Hill Inn. Coupled with the fact that I wanted to visit the Ordnance Survey concrete ring on Robert’s Seat (sad I know) I planned this route which would also taken in portions of the valleys of West Stonesdale and Whitsundale. For ease of parking the walk started from the parking area on the opposite side of the road to the Tan Hill Inn. As the highest inn in the country the Tan Hill Inn is quite probably the best known pub in the Yorkshire Dales. Situated at 1,732ft above sea level it is also one of the remotest and bleakest locations in the Dales. This of course adds to the appeal of the place. From the Tan Hill Inn we walked a short distance west to reach the road junction. Turning briefly left along the road to Keld we soon turned right, off the road, on to a footpath descending towards Stonesdale Beck. This was a really enjoyable section of the walk, the thin path dropping down into the upper reaches of West Stonesdale whilst patches of sunshine began to appear over Thomas Gill Hill and Robert’s Seat ahead of us. After a short stretch alongside Stonesdale Beck itself we crossed the stream via a footbridge to take a path up above the deep cleft of Thomas Gill. At the top we turned left for a very easy walk on grass following a quad track up Thomas Gill Rigg. It is worth noting that the signpost and path on the ground is further east than the right of way as it is marked on the map. Once we’d passed the scattering of rocks of Robert’s Seat Band we made a detour from the path up to the fence crossing the top of Robert’s Seat. As this is not marked on some of my earlier OS maps the fence must be a fairly new construction. Turning left we followed the fence to a bend, just the other side of which was the concrete ring. How it was used by surveyors and why it was built rather than the more traditional pillar I don’t know. The ring was however clearly inscribed with the words ‘Ordnance Survey Trigonometrical Station’. The panorama was one of seemingly endless moors with the likes of Nine Standards Rigg, Rogan’s Seat, Great Shunner Fell and High Seat all on view. From the top of Robert’s Seat we continued following the fence until it rejoined the path. Turning right we crossed a brow and the ruined hut with the rather grand title ‘Robert’s Seat House’ to being an enjoyable descent towards Ravenseat in Whitsundale. As we neared the farm we spotted not just one but four lapwing chicks. Although I stopped to take some pictures I resisted the temptation to move too close as our presence was already distressing the parents. After passing Ravenseat we continued on a path that gradually climbed up above Whitsundale Beck. This section included good views down into the gorge of How Edge and the sudden drop called Oven Mouth. Not long afterwards the map shows a fork in the path. In reality the upper path, which was the one we wanted to take, was neither signposted or seem to exist on the ground. Instead we just contoured around the southern edge of the moor at about the 410m mark to reach the tarn at Tom Hags. Although fairly small it was seemingly popular with local waterfowl, as well as sadly fatal for a dead sheep that we saw half-submerged in the reeds. From the tarn we finally found something resembling a path which dropped down alongside Stonesdale Gill into the small hamlet of West Stonesdale. On the other side of Stonesdale Lane we took a path dropping steeply down a sheep pasture to a footbridge over Stonesdale Beck. On the other side of Stonesdale Beck we stopped for a bite of lunch on the limestone ledges above the beck, it was a truly lovely spot and one of the highlights of the walk. After lunch we followed the faint path upstream for a while before it began to climb away from the beck. Once again there was a divergance between the route of the path on the ground and how it is marked on the map. It is worth noting for example that the stile crossing the wall below the Pennine Way is around 100m further north than the map indicates. Once we had navigated our way across this less than clear section we reached the Pennine Way. From there it was a very straightforward and gradual climb north back to the Tan Hill Inn. In its early stages there were still some views of West Stonesdale but gradually the views became more and more of the bleak moors surrounding the pub. Needless to say before we left we popped into the Tan Hill Inn for a quick drink – just a Pepsi unfortunately as we were both driving. All in all this was an enjoyable walk though if I were to do it again I’d be inclined to do the route in reverse. Firstly, because it would make route finding easier. Secondly, the views of West Stonesdale descending the Pennine Way would have been better than the increasingly dreary views (not helped by the extensive cloud on our walk) on the final stages back to the Tan Hill Inn.